The City of Phoenix can be a wonderful place to live for someone who likes to be in a desert climate with a year-round warm weather cycle. Granted, the summers can be hot, but the winters are far warmer than many other locations in the continental U.S. However, like many areas that have little or no vegetation to keep the dirt and soil in place on the ground, Phoenix can realize some outrageously large sandstorms during high wind periods. With all that soil and stone debris flying around, eventually a car windshield is going to get damaged. Legally, a car or truck with a damaged windshield has to be repaired by the owner. If driven on a public road with a cracked glass surface, a law enforcement officer can give the driver a stiff penalty ticket. Additionally, the weakened windshield creates a serious risk for the driver in the car, capable of fully breaking at any time rather than deflecting other flying debris on the road. Phoenix auto glass repair, however, is quite affordable and available for all types of vehicles and personal budgets. Minor repair can be addressed with on-site treatment of the chipped glass, sealing the glass surface so that the weak point doesn’t begin to spider-crack and spread out across the rest of the windshield. For large-scale repair, entire vehicle windshield replacement can be professionally performed, removing the old, damaged windshield and replacing it with a brand new surface. The new unit is then locked into place with the correct industrial adhesives and mounting to provide a reliable, pressure-treated barrier for the driver to see through. 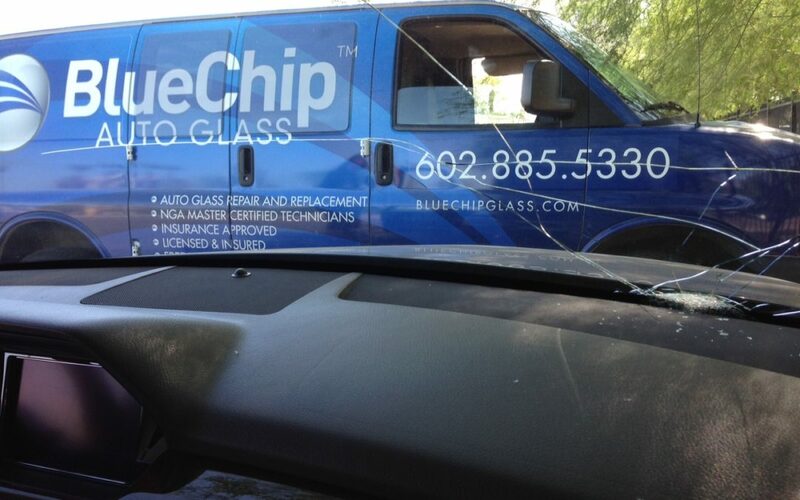 For quality Phoenix windshield repair in the metro-Phoenix, Arizona area as described above, Blue Chip Glass is the company to trust and rely on, both for small and large repair jobs. The company’s technicians are trained both with the best repair methods as well as years of experience, being able to handle multiple nuances that can occur from car to car. Even those who think that a windshield repair may be too expensive to handle at the moment should give Blue Chip a call. In many cases, a lower-cost repair may be very possible once the company has actually examined the specific damage. Drivers should never try to string out a bad windshield just to save money. It could cost a life.